After two days in Alentejo we drove to the Cima Corgo region of the Douro to spend a day with Assobio, and Quinta Dos Murcas. 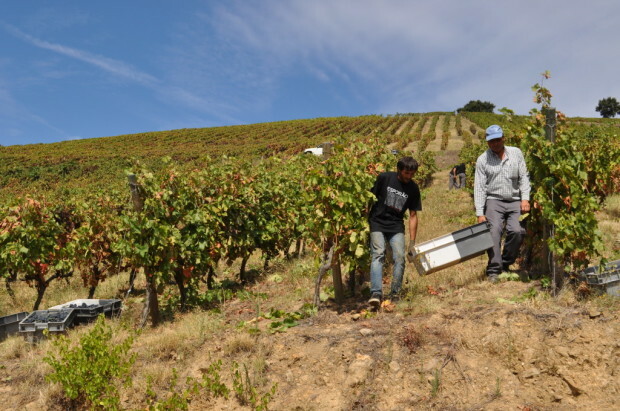 Vineyard manager, Margarida Figuerieda brought us to the top of the vineyard in the back of a small pickup truck to see the first vertical vineyard planted in the Douro — a practice taken from the Mosel after Quinta Dos Murcas then-winemaker visited the region. The south facing 30-degree slope receives lots of sun exposure, and therefore ripeness. The Douro region carries lots of schist, with the Douro Superior (closer to Spain) primarily populated by dark schist. The rock is used to make posts at the ends of vineyard rows, rather than wood. Assobio red wines are harvested from a cooler planting behind Quinta Dos Murcas where the wind picks up whistling through the canyon. The cooler pocket keeps more freshness in the wines. The label name, Assobio, is the sound of the wind whistling. West up the Douro sits the Quinta Vale Figueira vineyard, named for the fig trees that grow there. New buildings cannot be constructed on raw land along the Douro. However, many of these properties include old winery ruins from the last two centuries. Land already containing a structure such as these can be rebuilt for a newer purpose. The day we visited, September 11, 2014, harvest began on Tinto Roriz (also known as Aragones in the South, and Tempranillo in Spain). It was the first day of harvest at Quinta Dos Murcas. Winemaker Michael Wren leads the Douro winery during harvest. We were able to taste tank and barrel samples of the 2013 Assobio, and Quinta Dos Murcas Reserva red blends. Then taste 5 and 10 year tawny ports from cask. The house makes only 10 year and vintage ports but works towards a 5-year tawny style to use for blending with older barrels into a 10 year style.